A hot air brush is like a round brush and a hair blower combined in one. As you style your hair with the brush, hot air is released around it to set quickly the hair and style it the way you want to. The hot air from the brush is adjustable to your preferred heat, and you can choose from battery powered to plugged into electric sockets. It also comes in different shapes and sizes so you can either choose the big one to accommodate more hair on every brush or a compact version, so it's easy to bring anywhere. 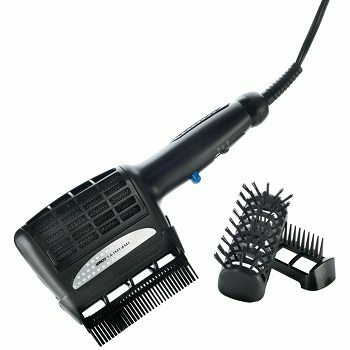 Helen of Troy 1579 Hot Air Brush is a styling brush and blow dryer in one but will never tangle your hair. 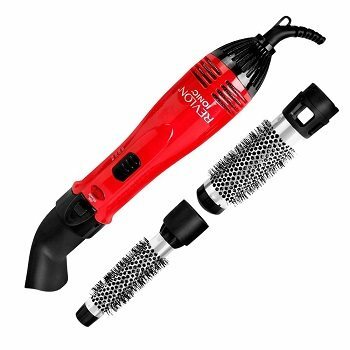 It also features a soft-grip handle for better comfort and good hold, dual heating setting for quick drying and styling, vented rotating barrels for easy styling and fresh tips for control. Best of all, it comes with a one year warranty. The Tourmaline Ceramic Styler Dryer features the Tourmaline Ceramic™ Ionic technology that gently heats and smoothes down the hair cuticles which not only minimizes frizz but also leave your hair manageable throughout the day. 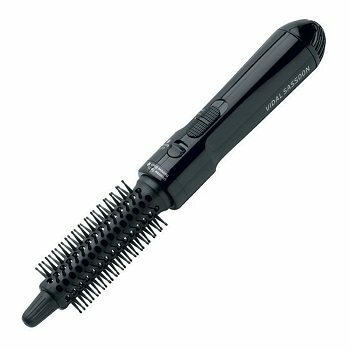 It also features 360 degrees flat swivel cord, two heat/speed setting, wide-tooth tangle-proof comb attachment, and bristle style brush. Total weight is 3.4 lbs and comes with a limited 2-year warranty. This Babyliss hot air brush creates good volume, shine, and lift in every use. And unlike the traditional hair blowers, its ceramic heat protects the hair from damage. Its conditioning ions and anti-static bristles are what makes your hair shiny and moisturized in every use 100x more. You can create different hairstyles by how you spin the brush or turn off its rotating feature and get another kind of hairstyle. Comes with forward and reverse control, three temperature setting, and Nano Titanium technology. Whether you have thick hard or thin hair, the Vidal Sassoon Hot Air Brush Styler, and Dryer is another good choice. Use the high setting to curl thick hair and flat for thin hair. You can use it every day without worry because it doesn't cause any damage to your hair through heat. Its an all in one tool that styles, cares, and untangles your hair.It also comes in 2-speed setting, flexible ball tipped bristles, barrel switch that locks and unlocks hair for smooth styling, and cords that will never tangle. 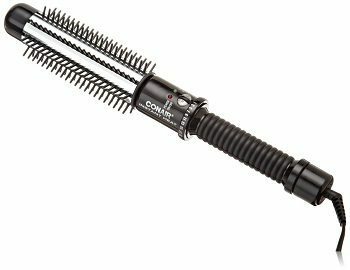 Another one of the best hot air brush for us is the Conair Hot Sticks Instant Heat Big Curl and Volume Hot Brush. With its one ¼ inch large-barrel curling iron and 30-second instant heat up, it can create the most beautiful and voluminous curls as quickly as possible. It only takes 60 seconds to heat up the unit and ready to style your hair. Plus it has Turbo Heat power boost that maximizes the heat for even faster hair styling without damaging it at a push of a button. But what sets the Conair Hot Sticks Instant Heat Big Curl and Volume Hot Brush apart from most brushes is its 25 heat setting that makes it ideal for every hair type. It's also perfect for travel with its dual voltage and as for added safety, the unit automatically shuts down so it will never overheat. It comes with two years limited warranty. Landing in our second rank is the Revlon Shine Enhancing Kit with Ionic Technology that not only makes it easier to dry your hair quickly but also infusing moisture from water into your hair, giving volume and minimizes frizz. It's also integrated with three speed and three heat setting with a quick shot to cater to every hair type needs. Comes with 1” and 1 ½ “ interchangeable aluminum thermal brush attachments for variety in curls from large to extra large. Each thermal barrel brush keeps the heat from 1200 watts of power. Switching from one barrel to another is easy with a push of a release button. And since it comes with ionic technology, each use provides silkier results. The number one hot air brush for us is the Art Naturals Anti-Static Ceramic Heating Brush Hair Straightener that can effectively straighten even the hardest to manage wavy hairs. Just plug in and it's ready to use in less than 60 seconds. Set it to your desired heat through its LED screen and start styling. Temperature can be adjusted from 140 to 446 degrees depending on how fine or thick your hair is. Soft and gentle bristles that evenly distributes heat to untangle effortlessly your hair and leave it smooth and silky.The Monster iSport Freedom wireless headset is a perfect choice particularly if you do aggressive outdoor exercises. No wire will restrict you from any kind of movements plus it's sweat-proof, water-resistant, durable, UV-protected and washable for daily use. To use it, just allow 1 to 2 minutes for the hot air brush to warm up and you can start brushing. Stroke from top to bottom until you have reached your preferred straightness. If straightness is not enough, you can increase the temperature but just be careful not to place directly it on your scalp. After using it, give it time to cool down before storing it. Both men and women can use it, Cruelty-free, Paraben-free, and made of recycled materials.